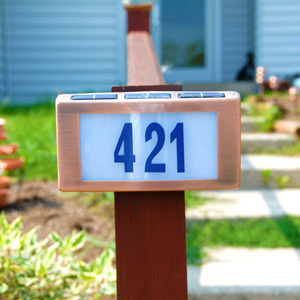 Solar address lights are functional, decorative, affordable and eco-friendly. Solar address lights are hundreds of feet away, look great both day and night, and complient any landscape and landscape decor. Solar address lights allow after-dark visitors to easily find your house without driving all over the neighbor, or around the block 20 times wondering if you had said "the fourth white house on the left" or was it "the fourth house on the right."